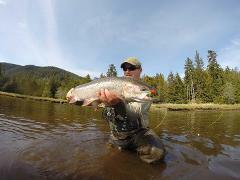 Enjoy an 8 hour day fly fishing remote rivers for Salmon, Trout and Char. Your transportation to the river estuary is by boat. At the river you will enjoy wading and fishing from the shore. You will enjoy hands on fishing called mooching on this 4 hour Saltwater fishing trip. Salmon are your primary target but there is also excellent fishing for other species such as Rockfish and Lingcod. We do not fish for Halibut. 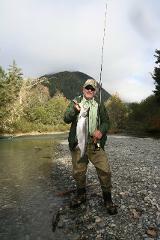 Enjoy a half day 4 hours fly fishing the local Sitka waters. This 4 hour trip includes all your gear, transportation and snack for a nice day fishing Sitka local waters. Trips start and end at the fly shop at 105 B Monastery St. 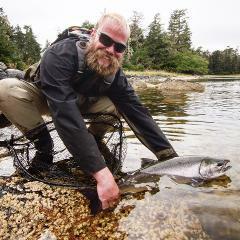 Spend a day fly fishing the local Sitka waters. 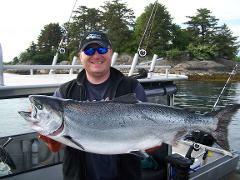 This 8 hour trip includes all your gear, transportation and lunch for a nice day fishing Sitka local waters. Trips start and end at the fly shop at 105 B Monastery St. 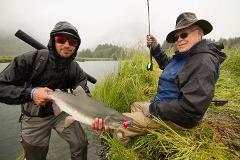 This is your opportunity to fly fish for wild Steelhead in the pristine waters Southeast Alaska. 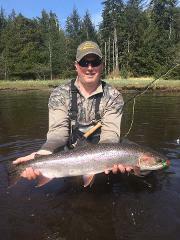 Spring is the season for Steelhead, so this trip is available in April and May. You don't have to bring gear this trip is all inclusive. Baranof and Chichagof islands are home to numerous small rivers that have runs of wild Silver Salmon. Fall in Southeast Alaska is perfect for getting out and enjoying some solitude while chasing beautiful wild Silver Salmon. 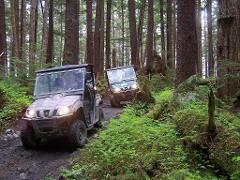 You will enjoy the excitement of flying in a float plane to remote waters and fishing for salmon, trout, and char. This 8 hour full day excursion is a bucket list item for many anglers. 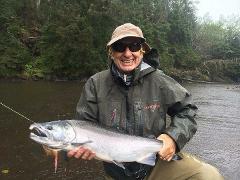 A full 12 hour day fly fishing remote rivers in the Alaskan wilderness for Salmon, Trout and Char. 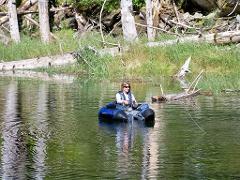 Your transportation is by boat making it easy to move between rivers where you will enjoy wading and fishing from shore. 4 hours Kick boat fishing still water lakes . Sitka has 4 lakes where you can fish for a variety of species including Grayling, Cutthroat Trout, Rainbow Trout, and Brook Trout. 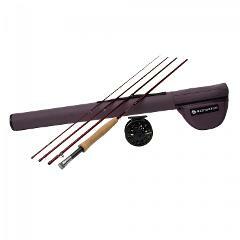 Multi day fly fishing package. 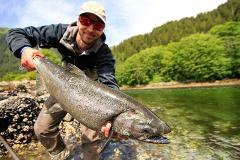 Includes 2 full days Boat Remote Fly Fishing and one day fly fishing Sitka local waters. Enjoy fishing the waters of Alaska with your companion on this private fishing trip from Sitka Alaska.